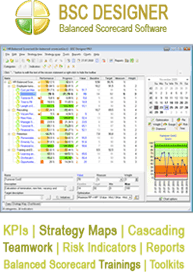 How does Balanced Scorecard KPI looks like? Here is one of the possible examples of Balanced Scorecard KPI, this report was generated with Balanced Scorecard Designer, the type of report is “Overview” so it doesn’t contain any values or weights of indicators, but has some information about main perspectives and metrics. So, the report contains names and descriptions of top-level indicators and groups. Also, the Advanced Report is available in the software. With Advanced Report user can have detailed information about balanced scorecard, including performance graphical charts.